In his commentary on the Noah story, Gordon Wenham observes a number of ways that Noah and Moses are typologically related to one another. In a section that asks how God’s mind was changed towards mankind after the Flood, he rightly suggests that the sacrifice of Noah had a propitiatory effect on God’s anger (Gen 8:20–22). In developing this point theologically, Wenham posits two things: (1) the acceptance of every sacrifice requires the antecedent grace of God and (2) the sacrifice of Noah serves as a “prototype of the work of later priests.” (Genesis 1–15, 190). In other words, Wenham deals with both the character of God that is both holy and gracious; and he contends that in order for sinful man to enjoy God’s mercy and avoid his wrath, a priestly sacrifice is necessary. Assigning to Noah a priestly role, he then relates Noah’s function to that of Moses another priest of God (cf. Ps 99:6). He cites R. W. L. Moberly with approval. Moberly is exactly right on at least two accounts. First, there is a distinct typological relationships between Noah and Moses. Only in Genesis 6:14 and Exodus 2:3, 5 do we find the word tbt (“ark”); in both instances we find men chosen by God to save their family (Noah) or their nation (Moses); and in both accounts that salvation comes through a violent, watery judgment (the Flood and the Red Sea ordeal). Second, the salvation that is given to Noah and Moses is entirely dependent on the character of God. In both events, God brings salvation through judgment. In both instances, God’s judgment and mercy is evident. And in the case of Moses, at least, there is the revelation of God’s mercy and justice in Exodus 34:6–7. But of course, as the author of Genesis, Moses knowledge of Yahweh also informs the story with Noah, where there too God is gracious to Moses even as he brings judgment on the rest of the earth. How true this is. Although under-appreciated by many, Noah and Moses mediate grace to people who deserve wrath because of their priestly service. While it is God’s gracious character that makes provision to propitiate his anger, in every instance in Scripture there is a priestly mediator who offers a propitiatory sacrifice at the place of God’s holy dwelling. Without this triad (priest, sacrifice, and altar/tabernacle/temple) humanity has no hope of atonement or salvation. 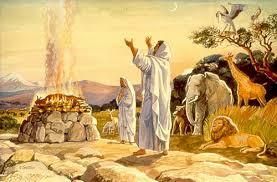 Therefore, in Noah and Moses, we see two priestly prototypes who adumbrate the Levitical system of priests. More importantly though, in these two pre-patriarchal priests, we also find a type of Jesus Christ himself—the priestly mediator of the new covenant. It is a glorious reality and one that we would do well to pay attention to that from the beginning of the Bible, God’s justice and mercy have been held together in covenant and in every instance those covenants have been mediated by priests like Noah and Moses.